Well this Memorial Day calls for rain so we have to bring the celebration in the house. 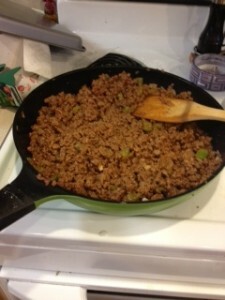 I made this sloppy joe recipe recently for a potluck at work and it was a huge hit. So since we won’t be grilling I am planning on making it again. Sloppy Joes can be made a ton of different way but I am no cook so it has to be simple and it can’t get any easier than this! Enjoy! Brown hamburger, onion, and pepper. Drain when browned. Add the remaining ingredients, heat and serve.